A sudden recent shift in American deportation policy may have dire implications for thousands of Haitians, and cause a bleak homecoming for many in the wake of destruction brought by Hurricane Matthew. The hurricane was billed as the most powerful storm to touch the Atlantic in nearly a decade as it made landfall in Haiti early Tuesday morning. At least 19 people were confirmed dead by the time the storm passed over the island of Hispaniola. And thousands more Haitians who are currently in America may soon face fallout from the disaster, all for a new change in United States immigration policies that critics warn is ill-fated and poorly timed. An Obama Administration directive unveiled last month was designed to put an end to temporary provisions that allowed Haitians to enter the U.S. without a visa. But the timing now seems less than ideal. Cutting back on the humanitarian-driven initiative — and thereby resuming regular deportations to Haiti — would come just as the nation begins recovery from the latest crisis. “Haitians don’t have a place to go back to,” said Andrea Guerrero, executive director of Alliances San Diego, an organization that has helped a large number of Haitians arriving in the U.S. "To shut the door on these people is to put them in a very vulnerable and dire situation that will have tragic consequences." The policy shift came out of an extraordinary wave of migrants coming to the U.S. As many as 5,000 Haitians were intercepted at the border within the last year alone, administration officials said last month, up from 339 entries the year before. Most all entered through southern California, overwhelming already stretched resources and raising alarms that many more would follow. In announcing the policy change last month, Department of Homeland Security Secretary Jeh Johnson said the situation in Haiti had “improved sufficiently” since it was hit by a devastating earthquake in 2010. But Guerrero attests that just the opposite is true. “It is an unstable and unsafe place, and it’s pretty clear that the conditions in Haiti have not improved,” Guerrero said. Six years after the earthquake upended Haiti and killed more than 200,000 people, tens of thousands remain displaced in vast tent cities throughout the country. And a cholera epidemic brought by United Nations relief workers has killed at least 10,000 people over that same time period. Meanwhile, political instability has lurched the country into flashpoints of chaos. The damage from Hurricane Matthew has even meant that the highly anticipated elections scheduled for the weekend would instead be postponed for a later date. The delays add pressure to an already fraught dynamic. Just a year ago elections dissolved into riots after residents suspected the results were tainted by fraud. Immigration advocates in the U.S. fear those issues, coupled with a bleak economic outlook and widespread food insecurity, could compound into a much larger issue with lasting effects. 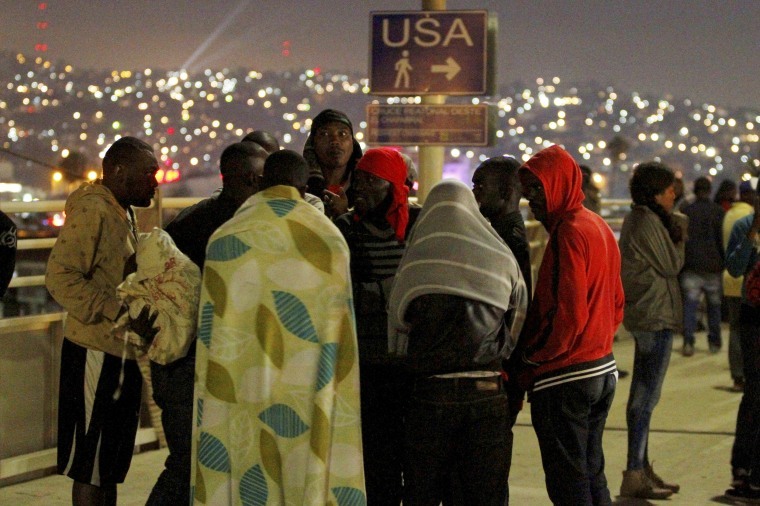 “Haiti has limited resources, limited employment opportunities and if deported, these people have a limited chance of prospering in such desperate conditions,” Ginger Jacobs, chair of the San Diego Immigrant Rights Project, said in a statement Tuesday. According to Jacobs, U.S. agencies seem at odds with one another in their assessment of the conditions inside Haiti. While the Department of Homeland Security pursues a more regular deportation schedule to Haiti, the U.S. State Department has issued several travel alerts on the books warning to stay away. The alerts point to high pockets of crime and limited access to healthcare and medical supplies. Advocacy groups that work closely with the Haitian American community and its leaders said they were completely blindsided by the policy change. The first notification that many received of Johnson’s directive, which would have an immediate impact on the communities they serve, was through phone calls from journalists asking them to respond to the news. Samuel Pierre, executive director of the Haitian American Caucus, said the community’s network of elected officials were anxious to see how the migration levels of Haitians compared to other groups, like Cubans, who were also allowed to show up at the U.S. border without a visa. According to the director of Immigration and Customs Enforcement Director Sarah Saldana, thousands of Haitians are currently en route to the U.S.
Marleine Bastien, executive director of Haitian Women of Miami, warned that thousands would then be caught in a limbo — turned away from the U.S., but with the option of returning home not really there. Amanda Sakuma is a national reporter at msnbc.